Our home features a spacious living room with a leather, queen size sofa bed, 46'' flat screen TV and dining set that comfortably seats 4 people. The kitchen is equipped with a full range of appliances - everything you need to treat yourself with delicious meals on vacation. The living room is connected to a balcony where you can enjoy mountain views while drinking your morning coffee. The third floor features a bedroom with a queen size bed and 32'' HDTV, and a large bathroom with a tub. The bedroom is connected to a huge covered patio with a hot tub and a comfortable patio set. My husband and I enjoyed our 2 night stay at this property. 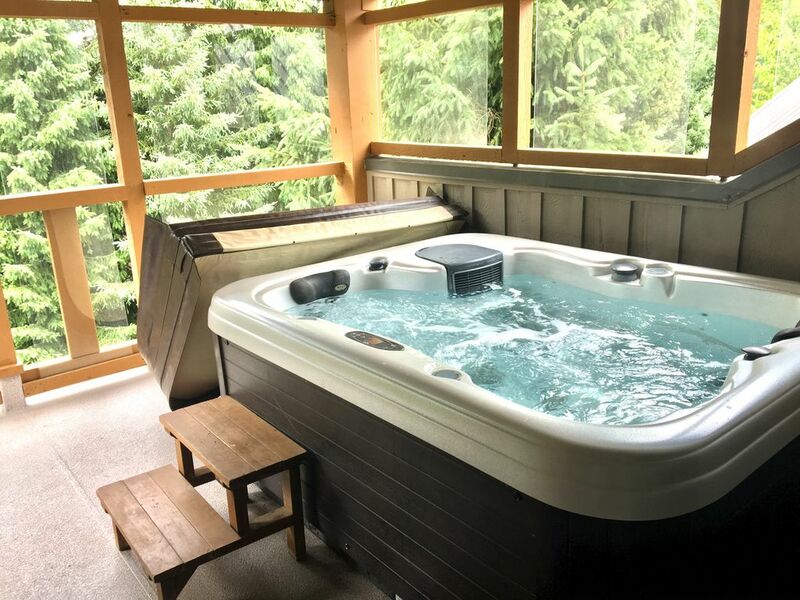 It was amazing to have our own hot tub and we loved that it looked out into the woods and you couldn't see or be seen by your neighbors. We thought the place was clean but could use some updates as it's a little dated but we didn't mind. The condo is very nice and we loved having a covered hot tub by the bedroom. But there was something terribly wrong with the bed. There was only one mattress. The mattress was very uncomfortable and squeeked everytime my girlfriend or I moved so we barely slept the whole 3 nights we stayed. This is very unfortunate because this is our only complaint about the place but it did ruin our stay. We enjoyed our time at the condo - the place was spacious and comfortable. The location was close to the shopping center and within easy walking distance of the village and resorts. Ian was very helpful and responsive in resolving a couple issues with the tv and sink. Having the private hot tub was very nice as was the underground parking. Would recommend coming back here for a couple. This townhouse was in a great location and had everything that we needed. The property had all of the amenities that we required and we particularly enjoyed the use of the private hot tub at the end of the day. We would certainly recommend this property to anyone who is looking for a nice townhouse in a great Whistler location. Stayed here with my fiancé and enjoyed it. Super close to the village and perfect for a couple. Perfect weekend away with the family! We had such a wonderful stay and we would highly recommend staying here. Ian and Boryanna gave detailed instructions/map before arrival which made everything easier. The townhouse was very clean and comfortable. We travelled with two young children and found it spacious. We absolutely loved the Hot Tub outside the master bedroom. It was super private with views of the trees and mountains. The fireplace on the main floor was cozy and we loved having the Netflix account! Lastly, it was only a few minute walk to the village so that was a bonus too. We loved it and we will be coming back! !